This particular hitch is rather beautiful because of its simplicity! 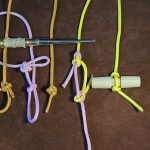 It is extremely easy to tie and also very easy to untie. However, once tied through the eye of an object correctly, this hitch is extremely secure. 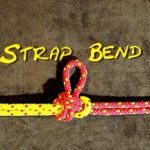 I have found that if the cordage when doubled and pushed through the eye as tight fit, the Knute Hitch is very secure indeed. 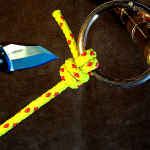 If ever you need to secure a tool or knife to a lanyard, then the Knute Hitch will do the job perfectly. 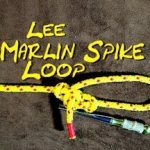 My understanding is that this knot came about when Briion Toss (Master Rigger), needed a way of attaching a lanyard quickly to his favourite marlin spike. 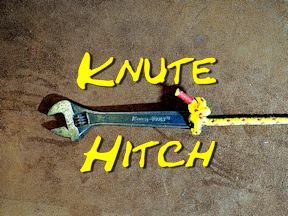 Is marlin spike was actually named Knute, hence this is how the Knute Hitch got its name. As you will see from the diagram above, this is not very far removed from the Knute Hitch.